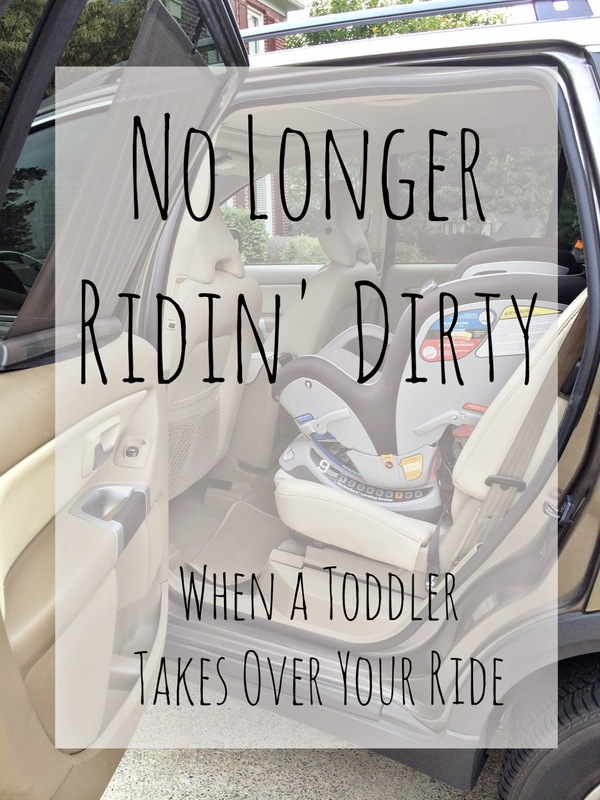 After introducing a little one into the family everything changed from date nights and travel arrangements, all the way to my morning routine and even my car's glove compartment. It's taken me over a year and half to properly equip myself with the tools necessary for touting a toddler all over town. I'd like to think that we've all been there - trapped in the grocery story, the aisles of Target or desperately searching the dark corners of a restaurant for the high chairs when our little one breaks out into hysterics. The reason is typically unidentified so finding a solution in the mists of this parenting-chaos is next-to impossible. People look at you with judgmental eyes, and then they are whispering what you can only assume are comments about how you need to learn to get "control" of your child. And isn't that funny? I don't I'll ever have "control" of my little guy. He is a year-and-a-half old he's behaving as every other 18-month old has before him. He's testing his limits and communicating in the only way he knows how to, by screaming. So to all you onlookers I'm sorry. For you parents, I've come up with some suggestions you can keep handy to help you in your time of distress. I keep these essentials in my car because I've been known to "accidentally leave my diaper bag at home" which is kind of like chopping off a hand and trying to play Beethoven on a piano. Plus my car is almost always in the same general area as my son and the worst kind of meltdown occur after you've crossed state boarders. Babies are walking, crawling, sitting messes. They seem to gravitate toward all things germy and dirty. There is no limit to the amount of baby wipes, hand sanitizer or Clorox wipes necessary to keep these little guys free from all the nastiness they attract. They are essential for diaper bags, stroller cubbies, changing tables and especially vehicle emergency kits. Blowouts and stink bombs are unavoidable, even the best diaper changers must face these poorly-timed smellies, having diapers handy is a must when you want to take your tiny tot out and about. For my little guy, few things can stop a temper tantrum in its tracks like a "cookie." In reality these pop tarts, crackers, breakfast bars and apple sauces - all commonly referred to as "cookies" at our house, can provide five minutes of sweet, sweet relief during a car ride meltdown. Nonperishable, that won't melt are your best options for in the car. If you happen to find something that won't produce tons of crumbs that's going to be your winner. Most important, is to make sure that you child likes it and will eat it - remember this is almost always in case of emergency, so it needs to work. Snot, tears, running mascara - you should never leave home without some trusty tissues. When in doubt hand your little one a toy. Give them something to distract them. It may only work for a couple minutes, but that's long enough to think of your next plan of attack. Sign a check, a permission slip, write down the number of a good babysitter - you never know when you might need a pen. To be Used in Emergency Situations Only: You might not be an advocate of the Paci, bink, nook but when push comes to shove - almost all of us cave at some point. Even batman has a sidekick. Keeping a Paci handy isn't going to stunt your child's growth but it may give you 15 more minutes of sanity. Best of luck mamas! 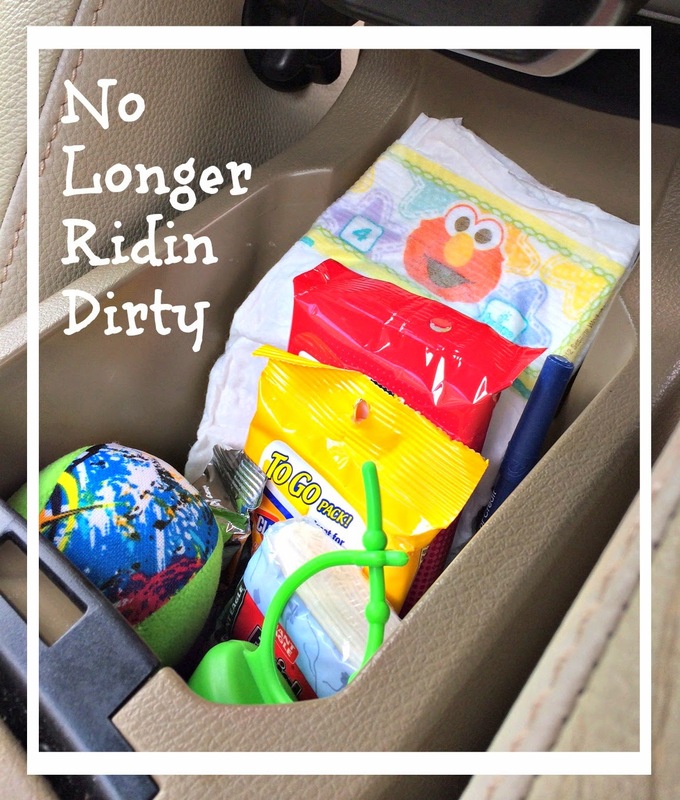 I hope this little list of car-essentials helps you on your next ride. With everything, this is a work in progress so please let me know if I'm missing anything to help in case of a car meltdown. Best thing I ever did in my car was to put a little box in the footwell below Little Man's seat! Great advice for keeping the car clean. There's always loads more floating around then you actually need. What a great suggestion! Thanks so much for sharing! Great post! I am so OCD...I clean out both vehicles every other day!!! WOW girl you are super Mom! I never clean mine (luckily my husband is awesome and does it for me)! Wow you are super organized. I start the week this way then by the end it's a total disaster, I only have a 6 month old can't imagine when we have more kids!!! Ahhh!! Love it. I always kept a stock of stuff for when I forgot the diaper bag! Now that my boys are older (3 and 4), my car stock is: a full change of clothes for each, toddler-sized prefold cloth diapers for cleaning up messes (and occasional potty accidents), small coloring books/mini markers/stickers/finger puppets to keep them entertained, Tic Tacs for bribery, a small first aid kit, and toilet paper (we live in a country where this is usually not available in public restrooms). Snacks and bottled water have to be replaced every time we go somewhere - I can't seem to keep them in my stock, so we just try to remember to take them as we're heading out the door. Thanks! I'd like to agree with you but while one part of my life is organized other parts (i.e. my laundry) are in shambles, but I'm doing the best I can and I'm sure you are too. I know you're doing a great job so keep it up! If you have more you'll adjust and find things that work for you. Thanks for the comment! Great suggestions! I should probably consider keeping a change of clothes with me since my little guy seems to find a mess wherever he goes! Thanks so much for the comment!